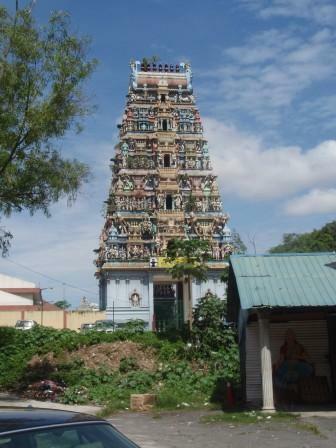 This majestic temple, with the largest ‘Raja Gopuram’ (royal tower) in South East Asia, was built in 1937 by a group of dedicated Saivite followers, lead by the late Dr.Viswalingam. The calm and refreshing vibration in this temple is spiritually intoxicating, nourishing for the soul, plucking off every worry in the stifling mind. This temple is strategically located opposite a Hindu burial ground, whereby the ashes of the crematorium are blown towards the entrance of the temple. Temples of this type are rare, and are known as ‘moksha’ (spiritual salvation) temples. The ‘Shiva lingam’ (denoting the infinite energy of the Lord Shiva) which has been consecrated in this temple, originates from the holy river Ganges in Kashi, India. 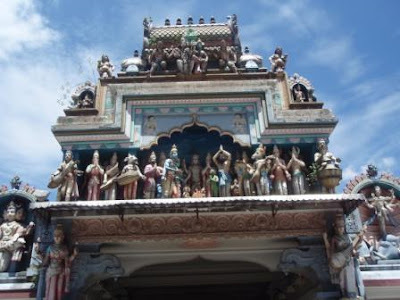 The original founder of this temple, Dr.Viswalingam had made a pilgrimage to India. As he was bathing in the holy Ganges river, he found this sacred ‘Shiva lingam’. This particular type of ‘Shiva lingam’ comes only from Narmada River, located in the west of India. This ‘Shiva lingam’ from Narmada river has been made popular by the movie ‘Indian Jones and the Temple of Doom’, whereby Indiana Jones was searching for the sacred ‘Shiva lingam’. The faithful devotees who ardently attend to ‘Puja’ (Act of reverence through invocations, songs, prayers and rituals) at this temple are abundantly blessed. A dedicated lawyer, who has been actively serving this temple, was promoted to a judge. Another prominent businessman, who was having a downturn in his business, soon regained the profitability of his business after repeatedly donating for ‘Abhishekam’ (Pouring libations on the consecrated deities). In addition, there was an ill-stricken cancer patient, who continuously recited the ‘Mahamrityunjaya Mantra’ (A life restoring mantra dedicated to Lord Shiva), was miraculously cured in 3 months.